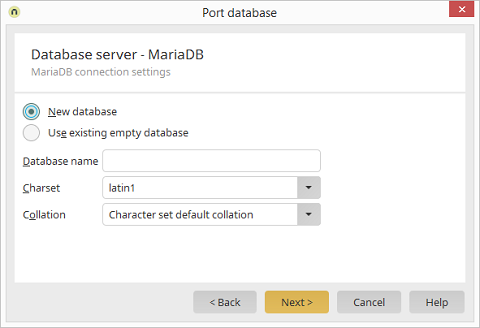 Create new portal General / Continue to Database server Database server / Select MariaDB / Click on "Next" Database server - MariaDB / Click on "Next"
Portal menu / Portal properties Database / Port database Database server / Select MariaDB / Click on "Next" Database server - MariaDB / Click on "Next"
A new database is created with this option. An existing database is used with this option. Enter a name for the database here. Select the encoding (character set) for the new database here. The preset (UNICODE - UTF 8) can be kept in most cases. In Windows, "collations" define rules for saving character data, based on the rules defined for the locale setting. The basic Windows collation rules specify the alphabet or language to be used if dictionary collation is used. The rules additionally define the code page to be used to save non-Unicode character data.